Buy 1 for $19.74Buy 2 / Save $1.05!Buy 3 / Save $3.95! All gentians were once regarded as a panacea. Pliny said that the herbs, which are extremely bitter-tasting, were effective against stomach complaints, digestive disorders, ulcers and skin complaints, including "the hairy affection appearing on the breasts at child-birth." The species most commonly used in medieval European health was the great yellow gentian (Gentiana lutea). In addition to Pliny's list, the roots of gentians can be used to help support fever, help stimulate the appetite and promote the flow of digestive juices and bile. Externally the herb was used for cleansing wounds. Gentians were used in the production of bitter liqueurs and aperitifs. Although known to the ancient Egyptians, gentians are reputedly named after Gentius, King of Illyria, who discovered their health value in the second century BC. Certain species of gentian, all of which are native to mountain pastures in Europe and Asia, were cultivated in England during the Middle Ages. Gentian root is one of the tonics, and regarded as febrifuge and antiseptic. it has been used in powder form, as a tea, syrup, liquid extract and a drink for intermittent fevers, dyspeptic complaints, flatulence, jaundice, some dropsical affections, skin problems and so on. Hailer considered it an excellent supportive for gout. This root is used in making elixirs of eternal youth. Gentian wine and syrup are extremely effective in cases of general atony and more particularly atony of the disgestive organs. 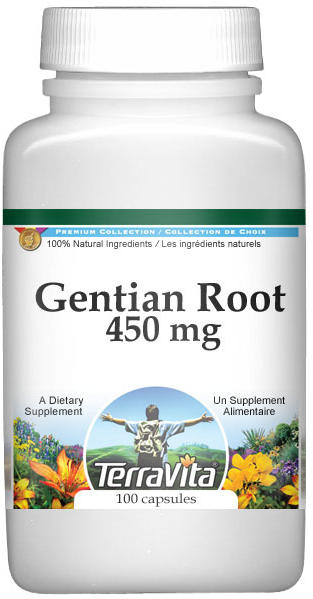 In surgery, Gentian root is used to great advantage to dilate the course of a fistula. The flower tops of Gentiana verticillata are used in the Antilles for intermittent fevers. The flowers of Gentiana Catesbaei were used in the southern United States in a decoction for pneumonia, as a tonic and sudorific. The inhabitants on the banks of Lake Baikel use G. Macrophylla Pallas for convulsions and delitium. In Russia, Marsh Gentian has long been a popular supportive for epilepsy. Gentian should not be used by people suffering from excessive stomach acid, heartburn, peptic ulcer disease, or gastritis.